Image from 1953. Class in Session. MADRID is internationally known for its bull ring. And New Orleans has its bull pen. It's not listed as such in the Chamber of Commerce "attraction book", nor will you find it specifically mentioned on the guided tour list of places to see in New Orleans. But, ask any Tulane university medical graduate about Tulane's bull pen and they'll tell you that of all the incidents that happened during their undergraduate training, the bull pen stands out, clearer and sharper than all the rest combined. junior and senior medical students of Tulane and the chairman of the department of surgery in the Tulane school of medicine, Dr. Oscar Creech-the bull. meet the four or five students who will perform later in the bull pen. histories-in exactly 30 minutes. For at 11 a.m., the first student will present his patient and his findings to Dr. Creech and the amphitheatre audience. Dr. Creech knows the history of each patient, but the audience, like the students, does not. At exactly 11 a.m., the bull enters the amphitheatre arena and the 60-minute show is on. As the first student presents his case, Dr. Creech either paces slowly back and forth or stands close by, listening, watching and waiting- for the first thrust. When the student is finished he steps back, mentally on guard for the first verbal plunge by the bull. It comes and comes fast. But instead of flashing horns, the bull uses barbed questions- why do you say that; what do you mean by relaxed position; why does your patient's heart sound the way you say it does; why is his skin yellow; how would he really act if he has what you say he has? Why? Why? Why? Why? With each answer the student gives, he gets more whys and hows in return. The verbal slugfest lasts from 15-20 minutes with Dr. Creech leading the student up to a correct diagnosis if the latter is wrong, or to an expansion of the diagnosis if it is right. The Tulane surgeon never forgets that the clinic is a class, devoted to seeing and learning and not just a demonstration of students getting gored. 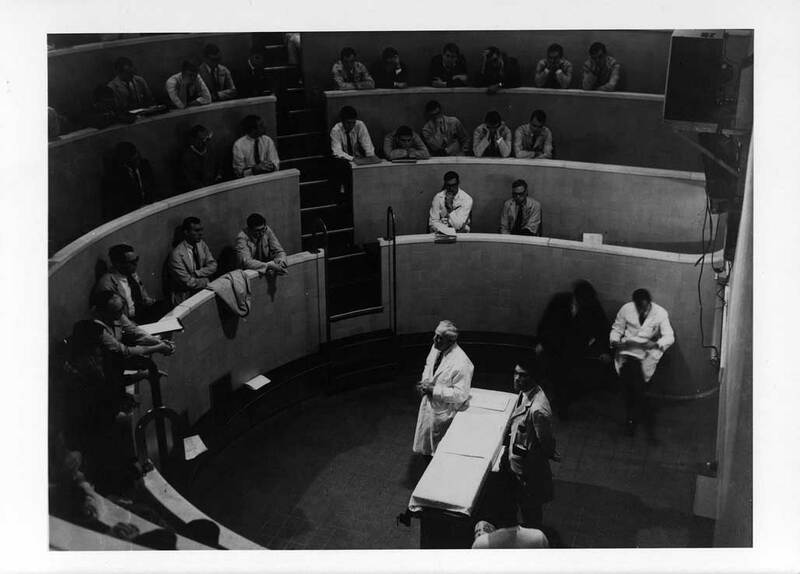 He interrupts case presentation periodically to spell out a similar case in medical literature to the audience, give a quick lesson in anatomy, quickly outline the correct surgical procedure pertinent to the case in the ring, or describe the most modern therapy available. Every so often, he turns to a resident physician, who is also in the know, and asks for further information on the case. If the particular student in the ring does not know an answer, Dr. Creech turns to the other students, who are sitting on the sidelines waiting to perform, to see if they do. He also fires questions at the audience. departments of surgery and medicine. In addition, Dr. Creech emphasizes that a wrong answer, dramatically corrected before such a group, will be remembered longer than a correct answer. Patterned after the diagnostic clinic of the late Dr. Ernest Sachs of Washington university, Tulane's first bull pen was held in 1927 with varicose veins as the subject, and Dr. Alton Ochsner the bull. The first student did an elaborate job of case presentation and presented his diagnostic finding in his best dramatic manner. He stepped back confidently. The bull floored him with his opening thrust. And the Tulane professors of surgey have been why-ing students ever since. Many of them now call the bull pen the why clinic. Because of the popularity of the bull pen, no roll is ever called. And very few seats are vacant. Standing room only is the rule. The audience is usually made up of Tulane students, Charity hospital interns, residents, nurses, Louisiana State university medical students, practicing physicians of New Orleans and visiting doctors. during their undergradate training at Tulane, they say, the bull pen incident will be remembered most. Lessons learned in the ring are never forgotten, they admit. Perhaps this is one way of saying they carry the scars of the bull pen the rest of their lives. Resident physicians of Charity, assigned to the clinic, must also be on their toes. Their actual patients are the ones presented, which means they must know their cases backwards and forwards. Philosophy behind the bull pen is "to teach students how to think under stress, a practice they will be required to do all of their professional lives," Dr.
Creech says. "They must learn how to think quickly and correctly, and be able to back up every decision they make. "In a few years these same students will have their own medical practice and an office full of patients . In many cases they will have never seen their patients before they walk into that office. Their task is to make a quick and accurate diagnosis, case history, physical examination, prescription, referral, appointment for surgery and a number of other things. Meanwhile, his office is still full of patients waiting to see him." Patients presented in the bull pen, the Tulane surgeon says, are typical cases, the kind students will meet in general practice. Periodically, a rare case is presented, because he says, "every once in awhile a general practitioner sees a rare case." Bull pen philosophy is geared to the philosophy of the Tulane medical school, Dr. Creech emphasizes. "We are not trying to make surgeons out of these students," he says. "We train them to become physicians." One of the best features of the surgical clinic, he adds, is that it is presented before "the critical eyes of a student's classmates. And no one is more critical than one's classmates. They have to make good."